David, this may sound strange, but I am not a soldier nor do I have any ties to a soldier. I am just a grandmother who picks up the Ranger when I can. I enjoy Ken's column and can't say that I 'enjoy' yours, but I do find it very interesting and I commend you for your honesty and courage. I wish you the best of luck and look forward to reading more about your challenging adventure. You are more my ideal of what a soldier should be. Thank you for all you have done for me and my country. I read your article and let me tell you, you are so talented and so brave. I have shared you article with my friends and they also agree that your talent to write and report all sides of a story marks the professionalism that we see on tv as well as in the big papers. The questions my girls friends asked me to ask you is- where did you learn to write like you do? Did you want to be a writer when you were young? My girl friend Sandy says she came across you one time and said that you are really pleasent and well spoken. If you remember she asked you when you were going to write the book, she said that you replied just like a true journalist " Everyday is a chapter worth writing." So not taking up your time, WHEN WILL I BE ABLE TO READ IT? 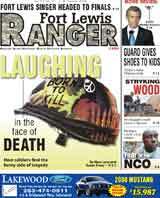 Thank you for all taking time to reading the Ranger. I havnt came to the site in while, but I thought I drop by and say "Hi" I read all the comments and also all my emails and I am so proud to have so many readers that care and want to help. The good news is things looking better as of date. I know lately my articles have seem bleak and as some would say reather unenjoyable, but the truth is that is just all honest writing. I wish I could write like the sun is out everyday and all is well, but that wouldn't be fair and I would be misleading. Finding someone to be my advocte is not something I plan on doing because I can do it. Believe me after last weeks article things are looking up. My intention remind you when writing is not to tell on people, reather just tell a story. When I first started writing for the Ranger my whole purpose was to give the world insight in what goes on, and from the words I read, many people are seeing it. I just want to say thank you for all your support and please remember my family in your prayers. This week was good and I know there will be more like that to follow. For cassie and friends, I remember your friend and let me just tell you- I am always willing to sit down and talk, with or with out the book being out yet. Just want to tell folks I had the honor to talk to Mr Hardt today at the hospital. I was reading the ranger and sure enough, Mr Hardt was sitting right across from me.